How to Get Rich as a Freelancer! It’s the new year! Let’s go through our checklist. Make a resolution to quit your low-paying work and become a freelancer? Promise yourself to earn more, by juggling freelance jobs with your full-time work? Decide to crawl back to a soulless 9-to-5 job after ending up bankrupt as a full-time freelancer? The best time to make a financial plan is NOW. But where does a freelancer begin their journey to financial freedom? How can we manage our money wisely? How--and where--do we invest our money to become a millionaire when we finally retire? 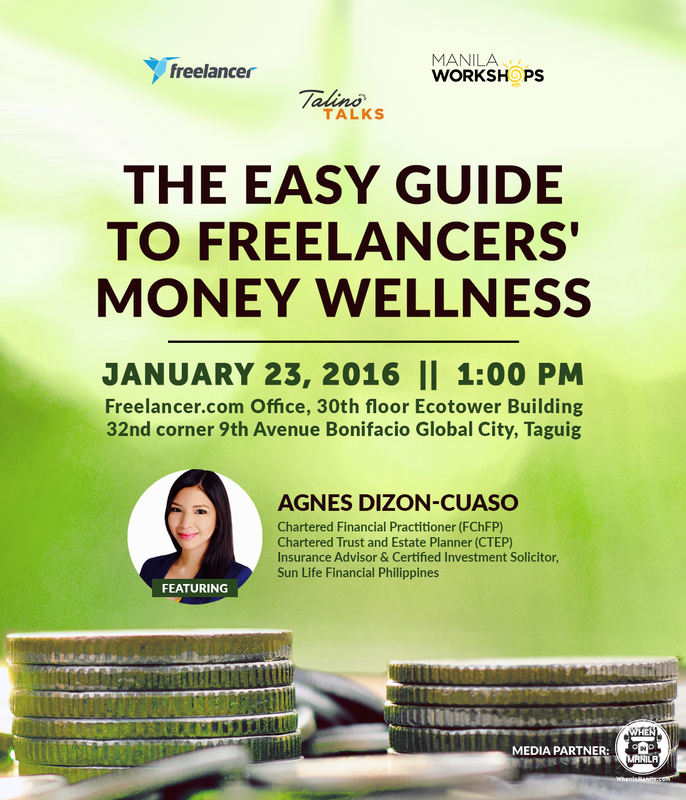 This 2016, top online jobs website Freelancer.com & leading workshops organizer Manila Workshops, together with media partner WheninManila.com, are giving you the best tips to achieve financial freedom as a freelancer. The speaker, Agnes Dizon-Cuaso, is a Fellow Chartered Financial Practitioner (FChFP) and Chartered Trust and Estate Planner (CTEP). She is also one of the country’s Insurance Advisors and Certified Investment Solicitor of Sun Life Financial Philippines. Agnes has been conducting Financial Wellness Workshops for companies, organizations, and individuals. Aw. Sayang I can't go. That would be an exciting and informative event, I'm sure. One of my regrets in life is that I didn't invest when I was still single. Now I'm married and I realize the effect of that wasted opportunity and money. Sayang. So, ikaw Steve mag-invest ka habang binata ka pa. It's easier to save and invest habang wala pang pamilya.